Heart Machine, the developers of the phenomenally successful Hyper Light Drifter has revealed its second game. The new game, Solar Ash Kingdom looks to be a significant departure from the teams first game in almost every way, as a teaser trailer reveals what appears to be a fully 3D world. There's not a lot to go on yet as the trailer focuses on several stunning panning shots of the locations players will likely visit during the course of the game. We're treated to beautifully alien techno-coloured worlds and get a glimpse of the player character gliding their way smoothly across the clouds before confronting a giant one-eyed monster with an energy based weapon. 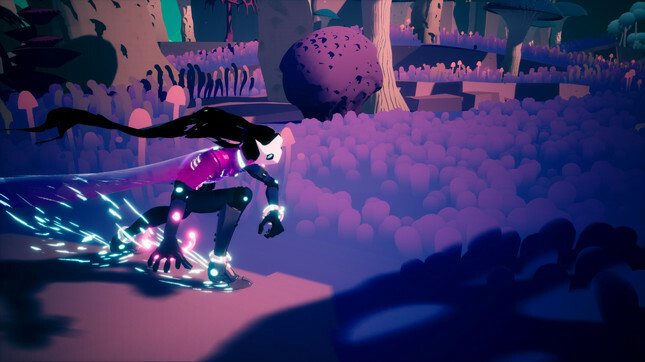 Speaking to IGN, Heart Machine's Alc Preston stated that Solar Ash Kingdom sets itself apart from the studios first game due to "a whole new set of incredible tech and key innovations." Only a PC release has been confirmed at this stage, but it's probably safe to assume that we'll see this one make its way to consoles too. Check out the gorgeous announcement trailer and let us know what you think of it in the comments below!